I woke up at 10:30 and 11:30 and finally got up noon. I don't know what stimulated me, but I decided to start laying out a tentative itinerary for the rest of our trip. Maybe I was getting a little panicky because we had spent so much time in Provence and we still have all of France to cover. This is day #40 of the trip and I looked back and discovered that I had done this same itinerary layout on day #44 of our Iberia trip in 2001 and on day #53 of our Scandinavia trip in 2003. So this time I was doing it a little earlier than in the past. I finally finished the layout and at 2:10 I started my run deciding to head along the river stream across the bridge through the park. In the river was another one of those fake islands with a palm tree but this one was painted all green. The view from here of the surrounding mountains and the church on the mount (Visitation, see later) was just beautiful. As I ran through a residential section, I came across this interesting church that looked Scandinavian. I went inside and was fascinated by the floor tile pattern that reminded me of the beach walkway in Alicante, Spain (right). Viewed small, it looks 3-dimensionally like intertwined lines but when you look at it up close, it is just a pattern of square tiles. They say EU men don't wear shorts, but I found one here that did; he was just out walking his dog. I kept going until I crossed a major bridge and it looked like I was heading into a large congested traffic area outside the Old Town area. Just across the bridge, on the right, I noticed this sign (above) pointing to the Promenade du Thiou (pronounced "two"). I dashed down the stairs and onto the path alongside the river. This was an excellent choice because the scenery was just beautiful for a run. I hope these photos capture the wildness of the area. I tried to find a short cut across a railroad bridge that I came upon but it was blocked off so I had to come all the way back the way I came, along the canal. 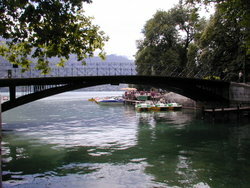 As I approached the hotel, I got this nice panorama shot of it; the brown building on the right of the bridge. At $81.33 a night, this was a real bargain because it was right in town and the room was pretty nice for a low-end Ibis hotel, especially during a festival. We were lucky they had a room. I went past the hotel (below left) and, at 2:45, I stopped and had a cappuccino at the Brand Café. It was a quiet little place and very relaxing. The owner was very nice. At 3:15, I finally headed out to explore this lovely little place. 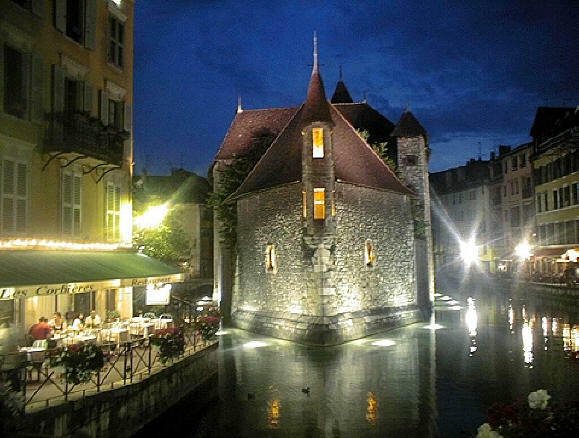 I didn't get to go there, but Annecy's Tourist Office (Office de Tourisme) is at 1, rue Jean Jaurès, Bonlieu, Annecy (photo left), +33-(0)4-50-45-0033, Fax. +33-(0)4-50-51-8720. 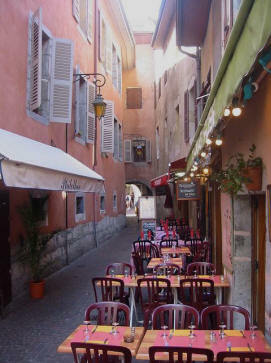 As I walked through the old town area, I became very relaxed. It was really fun not having anything to do but explore this pretty little medieval town. The more I walked, the more I became attached to it. Every corner and nook held a new surprise and all the people were very nice. To appreciate the specialness of this town, I have included a lot of photos of what I saw as I went around. Below right you can see the metal globe the girl was dancing in last night. 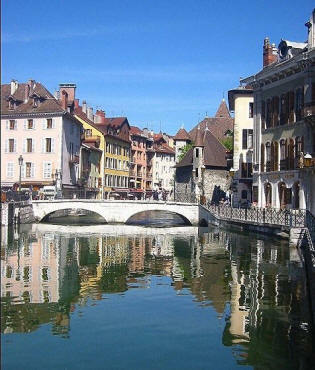 Here is the Thiou Canal with its buildings and restaurants alongshore in the daylight. Then I again came across the picturesque Palaise de l'Isle from the front end. 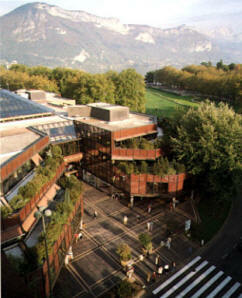 It now houses the Musée de l'Histoire d'Annecy. The two walks alongside the canal are called Quai de l'lle (right side) and Qaui de l'Evêché (left side). Below are stock photos of the Palaise at night and during the day. Coming along the canal going away from the lake, this (above) is the back side of the Palaise. And here is an artist making a painting of it. 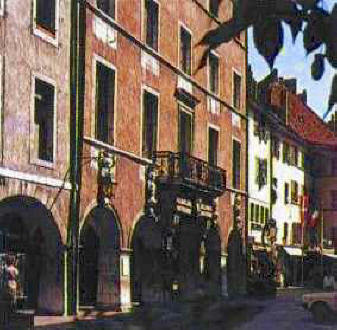 On the right (above) are photos of the famous Le Lilas Rose Restaurant. As last night, there were several street performers acting out what I don't know, because I couldn't understand what they were saying but the crowds seemed to be enjoying it. The bridge they were on led to this archway which was full of stores and oddity shops. 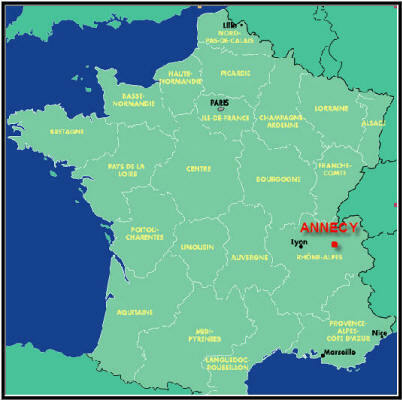 Here is a map I found of Annecy when it was very vieil (old.) 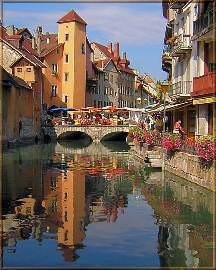 You can see the Palaise de l'Isle (labeled #11) in the middle of the Thiou Canal. Our Ibis Hotel is located at #5 at the canal edge. 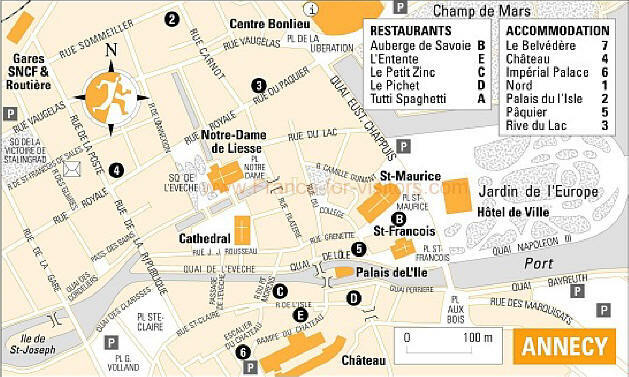 This modern map (below) shows the position of the major churches in Annecy as well as hotels and restaurants. At the bottom in the center you can see the large Château (castle) which sits above the hill and rue St-Claire. We never got the chance to go up there so here are a few stock photos of it. 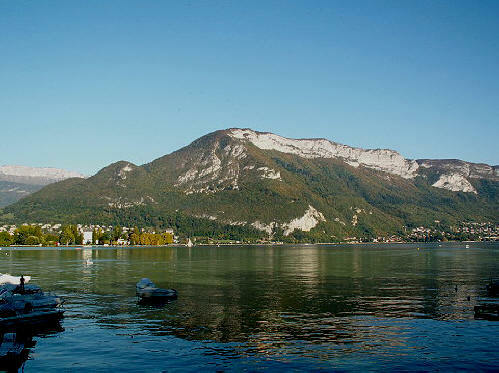 Human presence in this area can be traced from 3100 BC on a spot not far from Annecy’s present site, where the Thiou River empties into the northern tip of Lake Annecy. The original lakeside village, one of the oldest settlements in the Alps, fell to successive invasions, most notably Celts, followed in the 5th century by Romans. 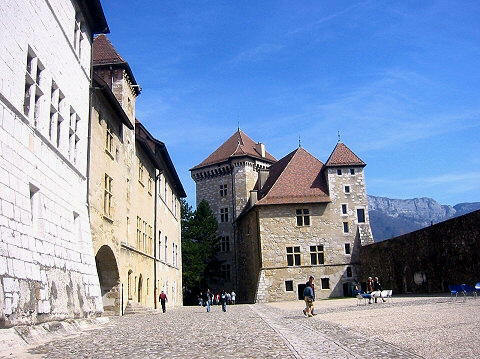 Emperor Anicius Olybrius built himself a grand villa on the lake, he called Anneciacum, thought to be the source of Annecy’s name. In subsequent centuries the Savoy region kept changing hands. 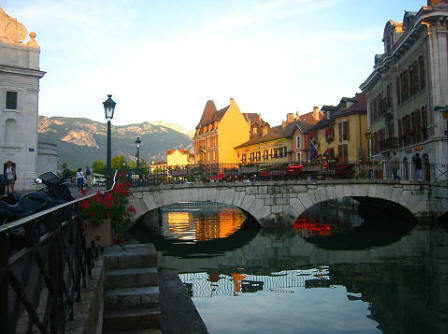 Sacked and rebuilt, Annecy went from mountain metropolis to backwater burg to strategic stronghold, probably reaching its peak in the 17th century, when it became known as the Rome of the Alps as Catholic theologians and intellectuals fled Geneva after it embraced the Reformation. 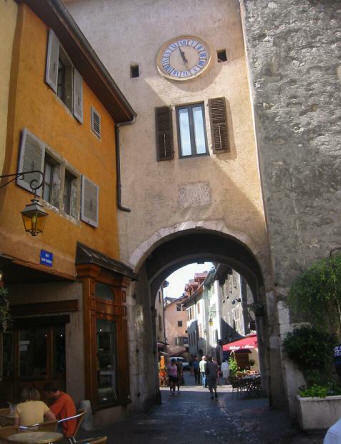 Several places I didn't get to see but are of interest in Annecy are the Hôtel de Sales on Rue du Pquier, which was built for the de Sales family (lower left) and the Old Town Hall (lower right.) 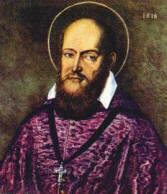 It is interesting that Count Cavour was a descendent of the de Sales family. As I continued my walk, I made it down to the end of rue St-Claire to Porte Ste-Claire or as they call it, the St-Claire Gate. On the left is how it looks as you enter it and the other is a stock photo of how it looks on the other side. 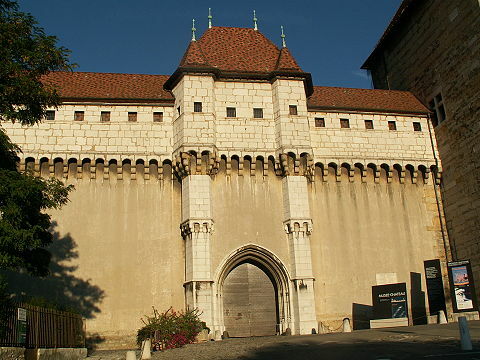 It guarded the entrance to the city from Aix-les-Bains and Chambéry. Here are various stock photo views of the bridges across the Thiou Canal, the one on the right is the Pont Monran. After walking across the Pont sur le Thiou bridge, I came across the church (eglise) of St-François-de-Sales (labeled #12) which we saw last night. 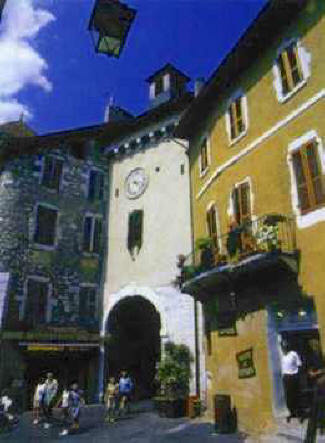 St-Maurice (below) is labeled #13 just to the north. St-François (1567-1622) (left) was the bishop here and devoted his life to gentle persuasive teaching and advocating a virtuous Catholic life. His book, Introduction à la Vie Dévote, became a bestseller throughout Europe in his lifetime. In 1610, he founded the Order of the Visitation with Jeanne de Chantal (a woman.) 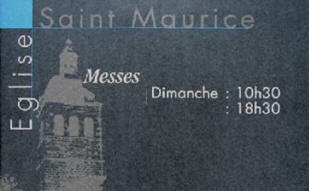 He was buried here, canonized in 1665 and made the patron saint of writers and journalists in 1923. 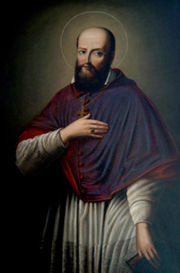 Annecy’s most famous son, Francis de Sales (right) was also a cardinal and an erudite theologian known for his spiritual writings. 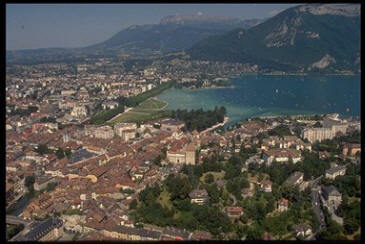 He sparked an enlightened cultural renaissance in Annecy, fostering the study of Latin, Greek and Hebrew. He tolerated diverse views, including Galileo’s (right) astronomy theories, which were banned in Rome at the time. 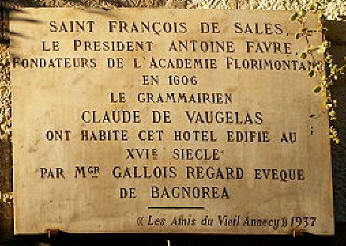 In 1607, he co-founded the Florimontane Academy (above right,) one of France’s earliest literary societies, which became the prototype for that bastion of French learning, the Academie Francaise. 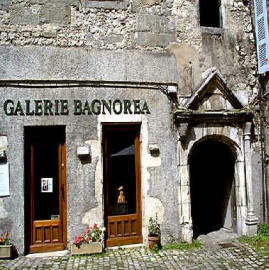 Above left is the plaque honoring him on the Hotel Bagnorea. 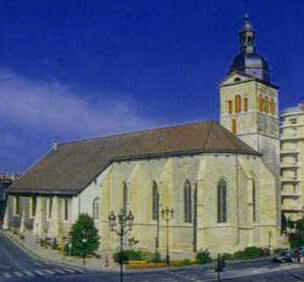 St-François' church was constructed in the 17th century as the chapel of the first Visitation monastery called "The Holy Source." It has had a brilliant past due to the historical significance of the beatification and canonization of St-François-de-Sales and Saint-Jeanne-de-Chantal, whose tombs it enclosed. The church was richly endowed by all the princes in Europe and they made it a place of pilgrimage. 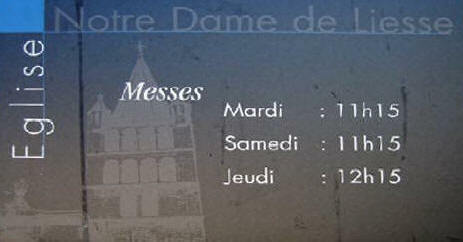 It was subject to a huge downfall during the French Revolution when it was partially demolished and completely cut up. It was only through the tenacity of a group of faithful followers that allowed it to be bought back to its original state at the end of the last century. It was restored and opened for worship once more in 1923 and it finally was acquired by the town in 1968. The remains of the Saints or what was left after the Revolution, are no longer kept there. 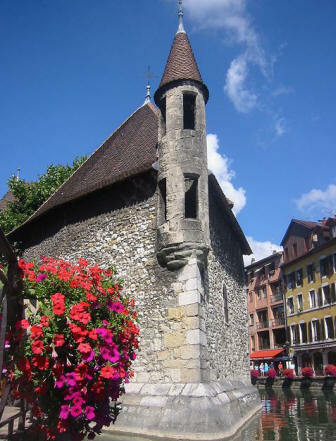 I continued north and came upon the Dominican Gothic church (eglise) of St-Maurice which was built in 1422 and is the oldest church in Annecy. Below (middle) is a stock photo of the back of the church. Below right you can see that a canal passes right beneath the church. After wandering, I soon came upon the church (eglise) of Notre-Dame-de-Liesse (below and stock photo above right.) 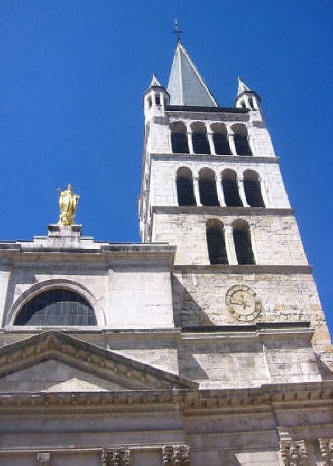 Its Romanesque bell tower leans slightly and atop the church is a gulded statue of the Madonna and child. In the Middle Ages, its miracles attracted pilgrims every seven years. It had to be rebuilt after the French Revolution. It was backed into a tiny plaza in the center of the shopping district. Just as I turned to leave the church, I saw a Bishop staring at me with a touch of disdain from his chair sitting to the left. I felt his steely eyes boring into me and I immediately walked swiftly out of the church in my running shorts. I then turned up the shopping streets. 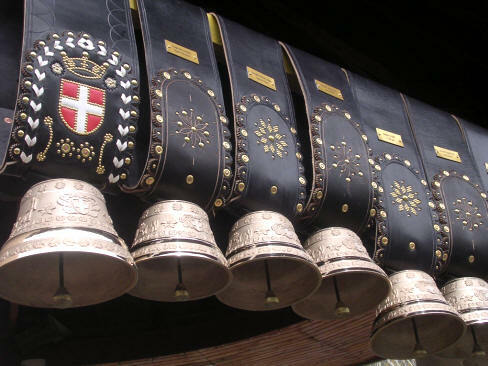 I walked by the Mayor's house (below left) and this is a display of Savoy silver cow bells. Then I got into the large park by the lake called Les Jardins de l'Europe. The Thiou River empties into the lake here and this is the canal where it ends. It is very nice with all the little boats lined up along the bank. Way off in the distance (below) you can see the bridge I crossed which is called Pont des Amours (stock photo left), for good reason because it is very romantic. Across the park and the lake looms Mont Veyrier. Below right is a stock photo of it. I wandered my way back into town and this is one of several gelato shops where they make the cornet maison (cone) in house and fresh. • grassy pastures:• 1 chicken per 10 m2• one flock of a maximum of 500 chickens, and between two batches of fallow period known as a "health break"
They also had an extensive supply of ribs and a variety of sausages (above.) Their store window displays were hard to pass up. The many postcards of the lake were beautiful and below right is one included in a souvenir thermometer on a wooden plaque. 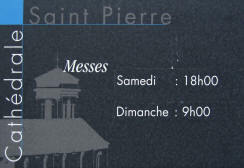 ...I came across the Cathédrale of St-Pierre. 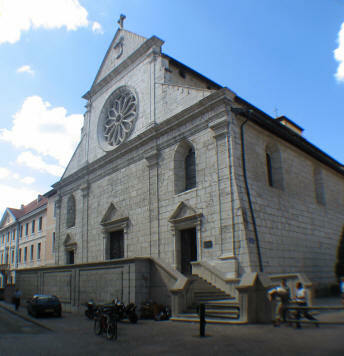 It has a Gothic-Renaissance façade and was built by the Franciscans in 1535. It was converted the Bishop's seat after the change of Geneva to Calvinism. Inside is a painting by Mazzola and another by Caravaggio. 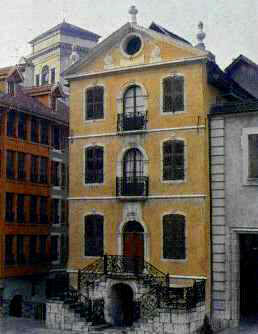 The Bishop's palace next door now houses a major school of music as well as Francis de Sales' Académie Florimontane. I then wended my way through this archway and came back out onto the street of our Ibis Hotel. The statue of Jean Jacques Rousseau is a permanent marble bust which graces the courtyard just off the Canal Notre-Dame, where Rousseau first set eyes on the love of his life, Madame de Warens, a 28-year-old who was 12 years his senior. His lover’s house here was replaced by a bishop’s palace fronting a street now named after the philosopher. But today the building is the city police headquarters. 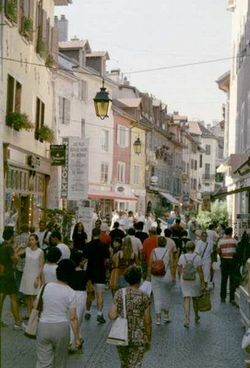 In old age, Rousseau, whose writings were an inspiration for the French Revolution, grew nostalgic about Annecy, longing to return to the place "around which my heart has never ceased to wander." I feel the same way. I got back to the hotel and changed and at 3:45 I wandered into a Monoprix department store and bought a nice red shirt that only cost me €4 ($5.) Then at 4:30 I began roaming the crowded streets and archways (below left) with my laptop open and the WiFi signal running. I was looking for a free WiFi connection. As I kept clicking the "refresh networks" button while I was walking through the crowds, many wondered what in the world I was doing. Finally at 4:45, I gratefully found a good WiFi connection down a long back street and right in front of an local antique shop. I sat down on the bench in front of the store and I was able to do all my AOL email, downloaded Rush and reviewed two scientific papers requested by the Journal of Cataract & Refractive Surgery. At 5:30, I moved to the very inviting pub next door called Finn Kelly's (left.) I enjoyed a series of two noisettes (espressos) while I worked on Diario #16. I then decided it was late enough (the sun was setting) so I had a pint of Beamish Red Ale. 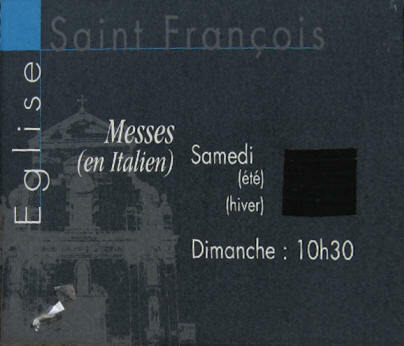 I tried uploading to the website but it didn't work so, at 9:00, fearing it was getting too late, I called Marcia and told her to meet me at Les Dieu Ducs where we finished up last night. I then ran all the way back to the hotel, changed and then walked all the way back to meet her enjoying a glass of wine after which we left and headed out to eat. At 9:30, we headed for well-respected Restaurant Bilboquet [14 Faubourg Ste-Claire, +33-(0)4-50-45-2168], that I had searched out earlier and found during my run. The problem was that now they were closed and they could not seat us. So at 10:15, we went across the street and decided to have dinner at La Taverna Grecque (The Greek Tavern) [15 Faubourg Ste-Claire, +33-(0)4-50-45-5026]. Marcia had a glass of verre vin and I had a Kronenberg 1664 French beer. Then we shared a bottle of Badoit and a bottle of Ekavi Retsina Greek wine which was actually lousy in both our opinion. We have heard that Greek wines were beginning to become better, but this was certainly not an example of that. They were both just OK. For an entree, we both ordered the brochet souvlaki (lamb skewers); mine came with big white beans (below left) and Marcia's came with stuffed peppers (below right.) It wasn't all that great - we should have stuck with French food. After dinner we strolled back to the canal area and spotted this lady walking down the center of the canal in this costume. Again we had no idea what she was about but assumed this was another "performance." It also appeared as if she was pregnant. We watched her walk under the bridge and then we moved on. 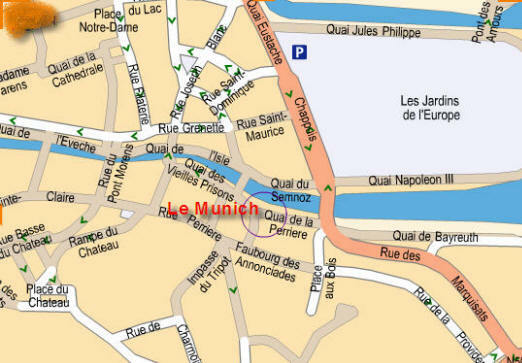 Then at 11:35 we decided to stop at one of the active bars along the canal called Le Munich [4 Quai de la Perrière, +33-(0)4-50-45-0211] because it looked very lively and festive. ...and at 11:45 we wandered back to the hotel and I uploaded all the photos and did some photostitching. All in all it was a very romantic evening in this charming little town. I got to bed at 2 AM.